Joe Carter, a licensed real estate agent in the McCall, Idaho, market, has joined the prestigious Haute Residence Real Estate Network. The Haute Residence Real Estate Network of Hauteresidence.com, affiliated with luxury lifestyle publication Haute Living, is proud to recognize Joe Carter as a prominent real estate professional and the network’s newest partner. Joe Carter has been revolutionizing the luxury lifestyle industry for more than 20 years. A veteran of luxury club operations and real estate sales, he began his career at the prestigious Piedmont Driving Club and never looked back. Joining the ranks of the Marietta Country Club and then the High Point Country Club, he has steadily worked to bring excellence and his keen business sense to every endeavor. Carter believes that it his very experience in club operations that served as the best foundation for his real estate sales career. Success in sales, he believes, is first and foremost about selling the club experience and serving the needs of the community. He quickly moved from club operations to leading a team of 10 agents managing more than 400 listings at Reynolds Plantation in Greensboro, Georgia. Working hand-in-hand with his team, he managed to negotiate 148 sales contracts totaling in excess of $80 million. 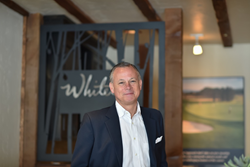 At Whitetail Club, Carter oversees all real estate sales activities in his role as designated broker, while still maintaining his status as an active sales agent. In addition to his real estate credentials, he is also a certified Community Association Manager and a certified Property Owner Association Manager.